A small but amazing area tucked away in a couple of caves on Muline Creek. The easiest line is Pocket Full Of Dreams (23), a semi-trad line up immaculate pockets then some very spaced flakes. 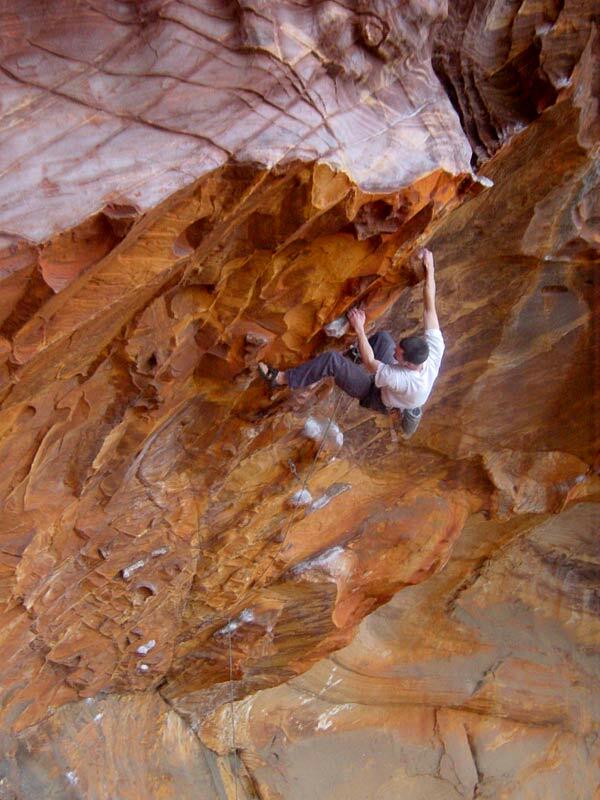 The hardest is Nathan Hoette's sport climb masterpiece 'Flower Power' (33). Walk up the old vehicle track a few hundred metres south of Muline Creek to a T intersection. Walk 20m right then head into the bush (rock cairn) hopefully following a track which gets better the closer you get to this crag. Located directly below Emu Rock. Walking time 25 minutes. Right: Australia's master of the steep stuff throws another lap on the 'warm-up' of Muline - Thrash and Dangle (24). Located in cave with large 'hole' downhill and closer to the road than Muline proper. An easy approach pitch from the left is required to access the cave. Killer roof on the best rock anywhere. The left trending route on the left end of the crag. Right: Nick McKinnon thugs through the rounded jugs of Thrash And Dangle (24). Steep amazing line just right of Thrash and Dangle. 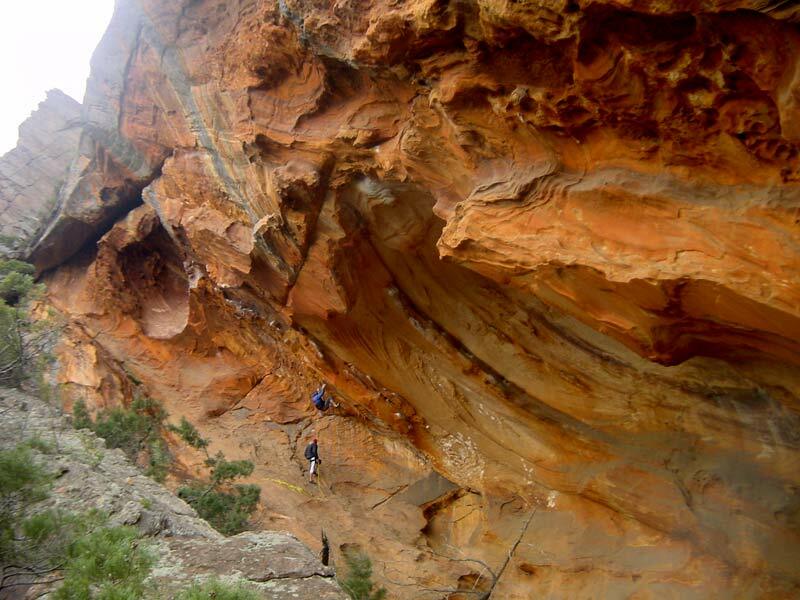 The most impressive 'line' of the crag and located two routes right of Thrash and Dangle and climbs the left side of the big cave. Sloper traverse start, downclimb the lip then climb immaculate steep face to anchor way out right. First ascent by Scott Walter. Half bolted. FH's leading out left from Pocket Full of Dreams. Uncompleted. Trad and two bolts. In the centre of the crag. Boudlery start to enter very pocketed wall past two bolts. Step right in little cave and up pumpy flake conclusion to chain. Bolts and trad. First pitch - tough bouldery moves past bolts lead to steep left facing corner. Thin trad up this to ledge. Second pitch goes up wall above past 4 bolts. Bolts and trad. Route right of After Midnight. Bolt to short left diagonal (cams/wires). Up past more bolts trending right. Bolts. Steep wall of imaculate rock. One of the best sport routes in Victoria. Bolts. Line directly right of Dameon Flower. Steep thin and desperate! One of Australians hardest routes. Bolts. Tough rightwards heading line right of Flower Power. Slopy. Bolts no anchor. Left leading varient with the same start as the unamed 26 on the far right side of the crag. No anchor as of yet. Bolts and cams. Route on far right of crag. use cams to get through top.